A well-established research finding in the economics of crime literature is that education lowers criminality. To demonstrate that this is causal and not just because people with higher education have other characteristics that make them less criminally minded, researchers have examined changes made in compulsory school leaving (CSL) laws that force some people to stay in school longer than they would choose voluntarily. These laws are then shown to simultaneously boost education and reduce crime (Lochner and Moretti 2004). What is less well understood is how this education policy-induced crime reduction comes about. One channel might be that the extra education makes the individual more productive in the labour market and so boosts employment and wages. In the classic Becker model of crime, individuals decide whether to commit crime by comparing the costs and benefits of criminal participation. At the margin, higher wages and more stable employment can tilt the individual away from crime. This would imply a long-run, sustained reduction in criminality for the group who received the extra education, compared those kids in previous cohorts who did not. An alternative, but not mutually exclusive, channel would be that the CSL laws force individuals to be in school for a part of the day. This is then a direct incapacitation effect – they simply have less time to allocate to crime. This mechanism would tend to suggest a short-term reduction in criminality since once the new school leaving age is reached youths are free to leave education. We have done some analysis to try and tease out the relative importance of these mechanisms using the set of CSL law changes that occurred across US states over the period 1980 to 2010 (Bell et al. 2018). By looking at both the short- and long-run response of arrest rates for those affected by an increase in the school leaving age, we can try and disentangle the effects. The empirical set-up allows us to estimate causal effects because we can compare the crime outcomes of cohort affected by the reform with those of the cohorts who left school just before the reform. Consistent with the general findings of the literature, there is a clear reduction in crime from the CSL laws. For individuals aged 15 to 24 in successive birth cohorts, we find that an increase in the school leaving age reduces the arrest rate by 6% for those affected, with somewhat larger effects for drug crimes. 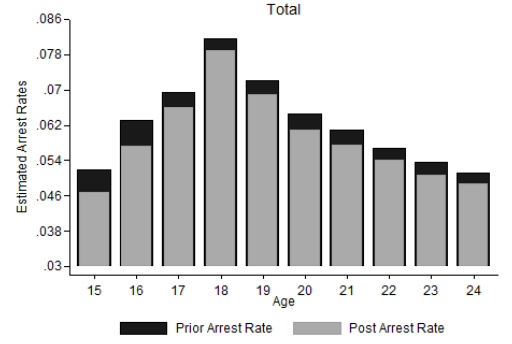 Because we can look at the same group of individuals up to age 24, we can examine how their arrest rate changes both when they are incapacitated in school and later when they have left. Figure 1 shows our estimates of the change in the crime-age profile for those affected by the school reform (light grey bars) compared to those not affected (dark grey bars). It is clear that the biggest effects occur at the time they are still in school – so incapacitation is a crucial element of why education reduces crime (Anderson, 2014). But importantly, arrest rates are still lower many years later. Does this therefore imply that the productivity-enhancing role of education is also important in the crime reduction story? Interestingly, the evidence suggests not, for the cohorts of American youth that we study. When we look at the subsequent wages and employment of those affected by the reforms, we find no evidence that they are improved by their additional time in school. Why is this? A key explanation seems to be that the CSL reforms that have been adopted in the US since the start of the 1980s have been affecting an increasingly small group of youths – since high school graduation rates were already high. These students are likely harder to educate and unlikely to progress to college even if they remain in school longer. This is in marked contrast to the reforms of the 1950s and 60s that Lochner and Moretti (2004) considered. Those earlier reforms substantially increased graduation rates and the evidence tends to point to better subsequent labour market outcomes. So why do we still find a reduction in crime at later ages, if there is no noticeable effect on wages and employment? The explanation lies in the idea of dynamic incapacitation. By keeping teenagers in school during a key period of criminal activity – crime rates peak at age 18 – CSL laws can prevent the exposure of some individuals to crime and ensure that they never proceed down the wrong track. This kind of incapacitation is likely better than prison for this because there is less opportunity to learn about criminal techniques than in the ‘University of Crime’. Complementary evidence from a CSL reform in Queensland, Australia provides support for this interpretation by showing that the probability that an individual ever commits a crime after leaving school is markedly lower for those affected by the reform. Policymakers can take two messages from these findings. First, any intervention that keeps young people busy and off the streets during this crucial period in their lives is likely to reap benefits in both the short and long run. Indeed our back of the envelope calculations suggest that if one only considered the crime reduction during the time they are held in school, the policy may not be cost-effective. But including the sustained reduction in crime after schooling has finished makes the reforms clearly cost-effective. Second, extending the age of compulsory schooling further may have fairly small effects on subsequent economic outcomes such as wages and employment. This is because an increasingly large share of youths are already voluntarily staying in school past this age. Anderson, D. (2014) “In School and Out of Trouble? The Minimum Dropout Age and Juvenile Crime”, Review of Economics and Statistics 96: 318-31. Bell, B, R Costa and S Machin (2018) “Why Does Education Reduce Crime?”, CEPR Discussion Paper No. 13162. Lochner, L and E Moretti (2004) “The Effect of Education on Crime: Evidence from Prison Inmates, Arrests and Self-reports”, American Economic Review 94: 155-89.